Today is my day on the Friendship Quilt Along! Welcome! ... our upcoming collection, AVALON. A fresh, summer feeling collection with beautiful reds, soft greys, buttery yellows, spring greens, all on an ivory background with a wonderful pop of navy blue! Due out in stores next month! We are so excited for this one we can hardly stand it! For those of you who are new over here, my name is Joanna and this is the home of Fig Tree & Company. We are so glad that you are here to see what we are up to. If you want to follow along our regular "goings on", then subscribe to our newsletter or follow us on our new FACEBOOK page! Click HERE to go to our page or LIKE us from the left sidebar. ... one of my favorite brand new patterns, LOLLIPOPS, made up in the AVALON collection with 1 Jelly Roll and some background and border fabric. There are no sewing templates in this pattern. I promise! Its a fantastic method that we have loved for years! 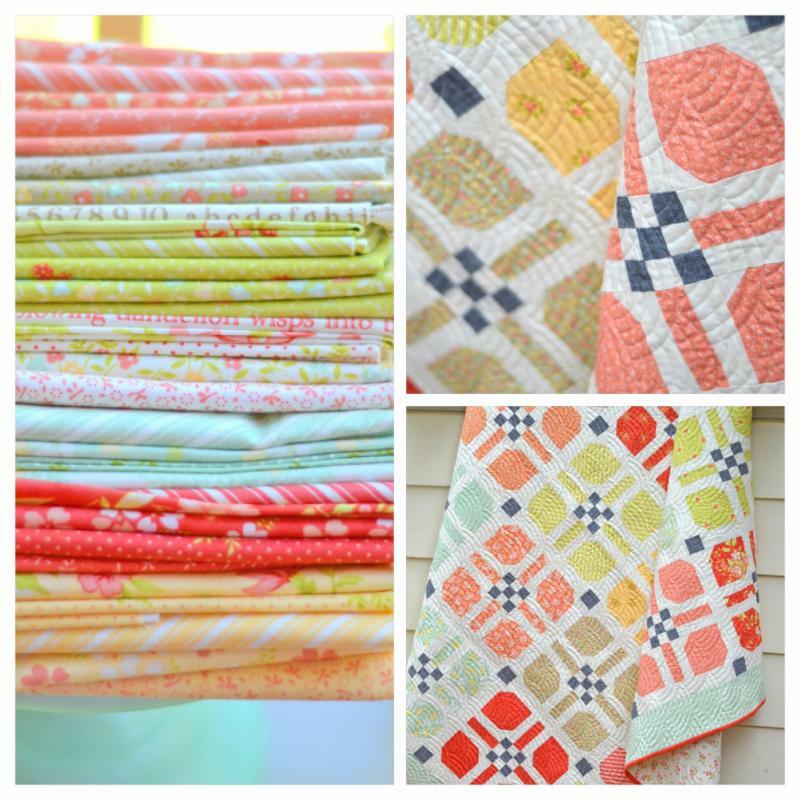 • Each day [starting last Monday and going through March 1st], 3 different MODA designers are blogging about the Quilt Along and are sharing their own block with you. You can see the list of designers blogging each day at the end of this post. Each block can be easily downloaded on each designer's blog as a pdf. 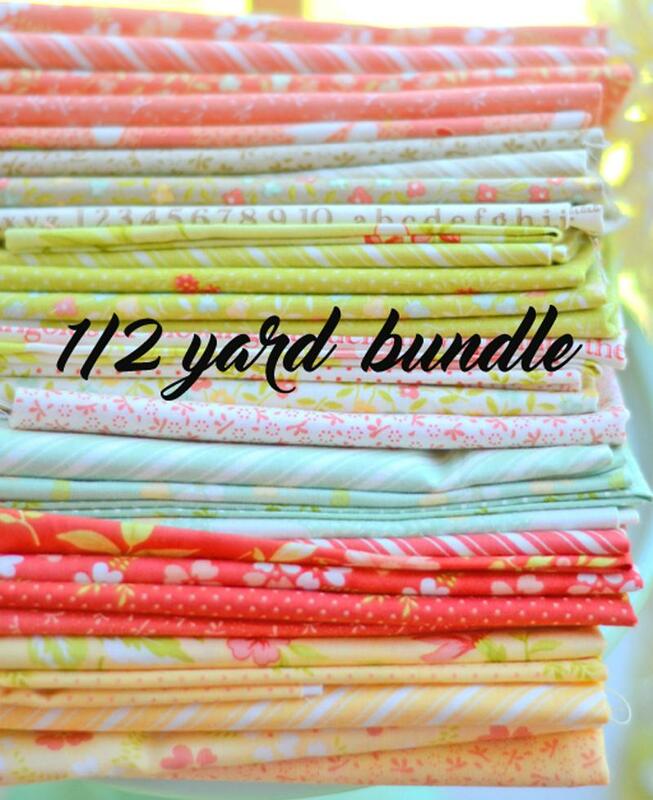 • Each designer is also having a MODA fabric giveaway [courtesy of the wonderfully generous MODA mothership] of one of their collections so if you enter at each blog, you will have a great chance of WINNING something. 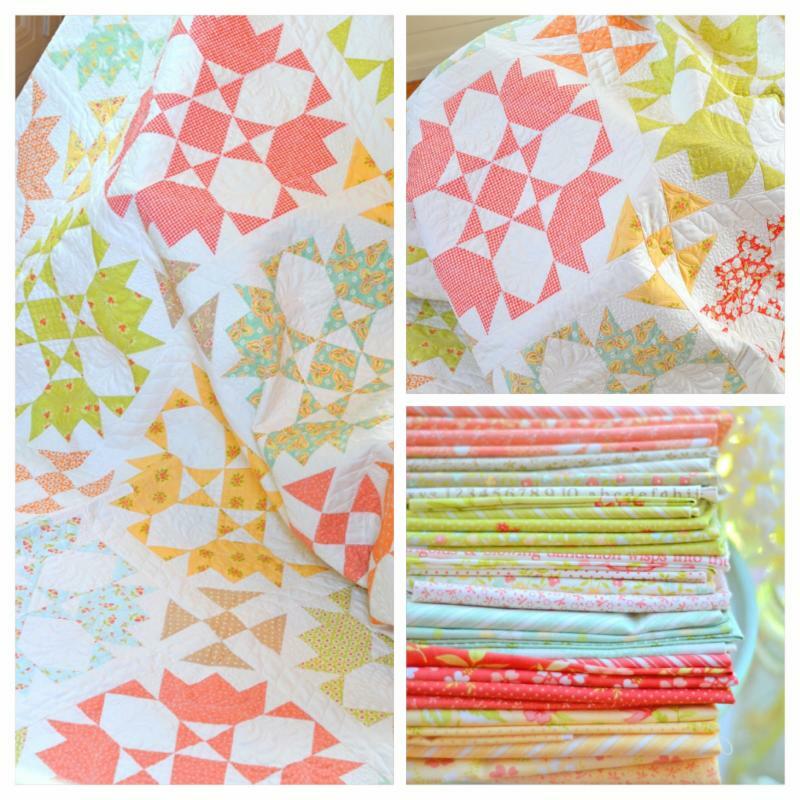 Free blocks and free fabric, is there anything more perfect?! 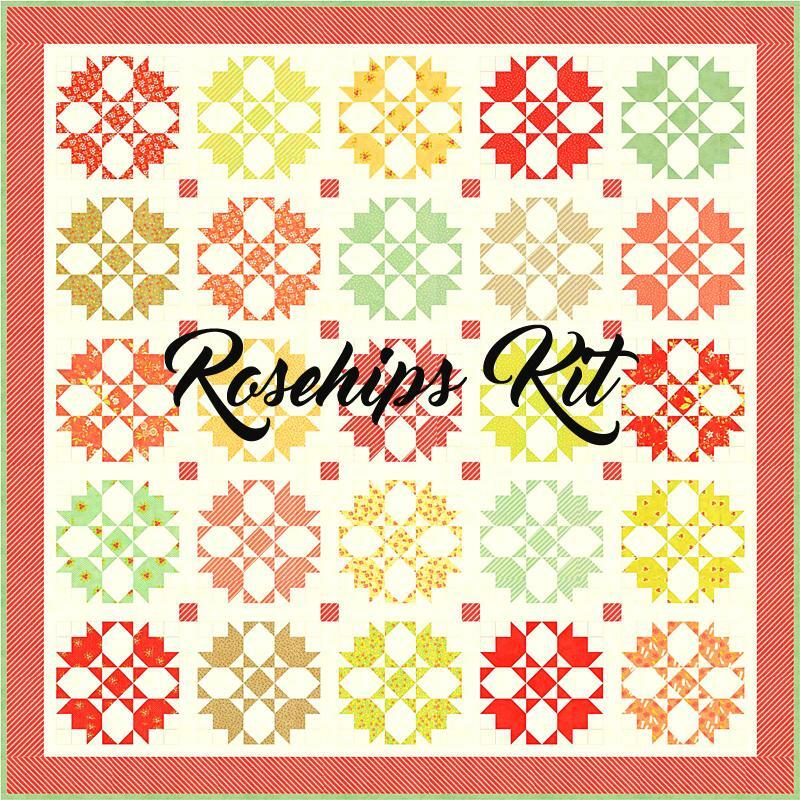 • All of the blocks finish at 9" and would all work wonderfully in a sampler quilt. 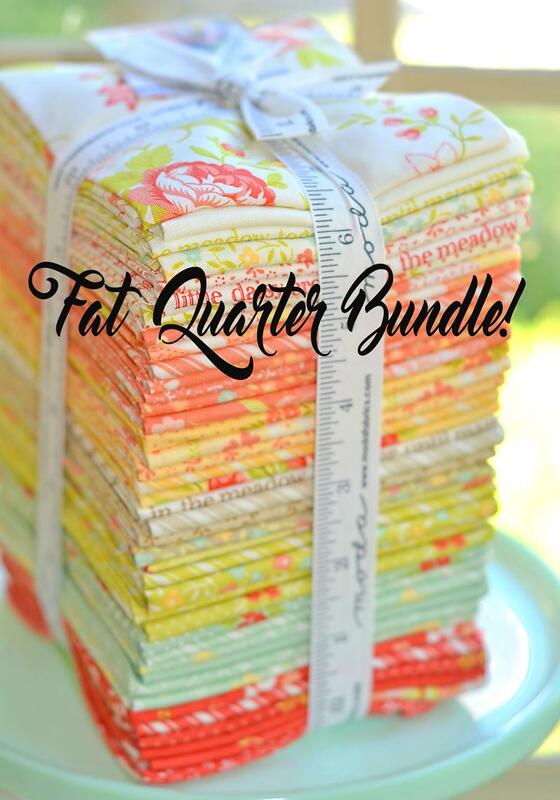 The instructiuons are all simple strip pieced and they all the blocks can be made from Fat 1/8's or large scraps so its perfect for your scrap bucket too.The directions for the blocks are all from Fat 1/8's. • Warning: This could be a bit too much fun. We have gotten a bit addicted in just 3 days time! 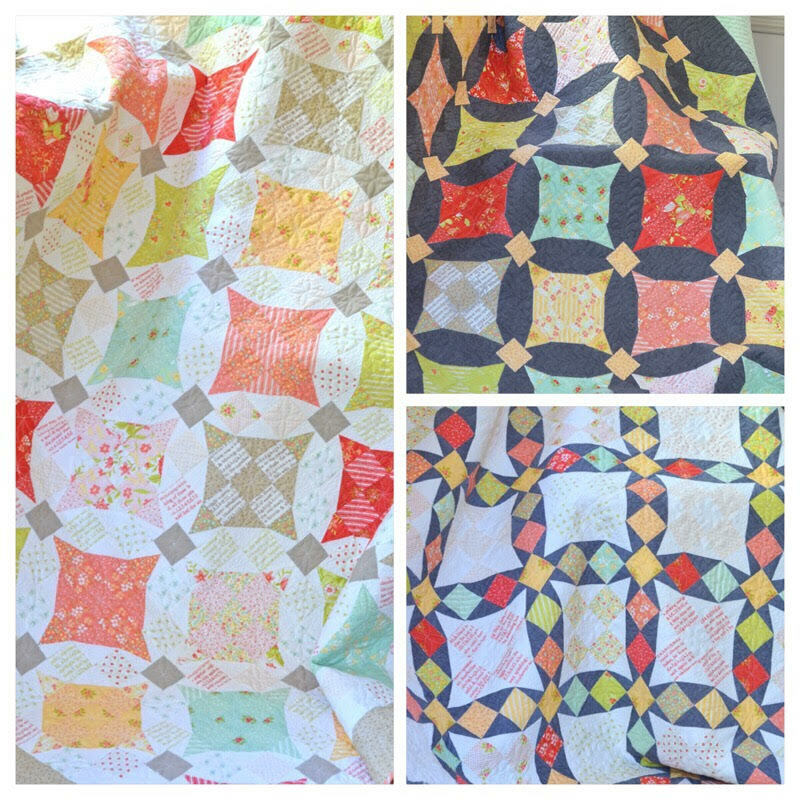 Now I have to tell you that I just couldn't get into the Farmer's Wife quilt along [the one that swept the web last year] for a couple of reasons... the blocks were so small and they were all templates. Two things which I really don't love. So personally I enjoyed that one from far away. They were beautiful but I was happy to watch it go by. This one... however.. is 9" blocks, which are just much more my speed, and no templates.That's right, not a template in site. This is our block... which I cut and pieced in under an hour, both of them. It's Block #15 in the Quilt Along. 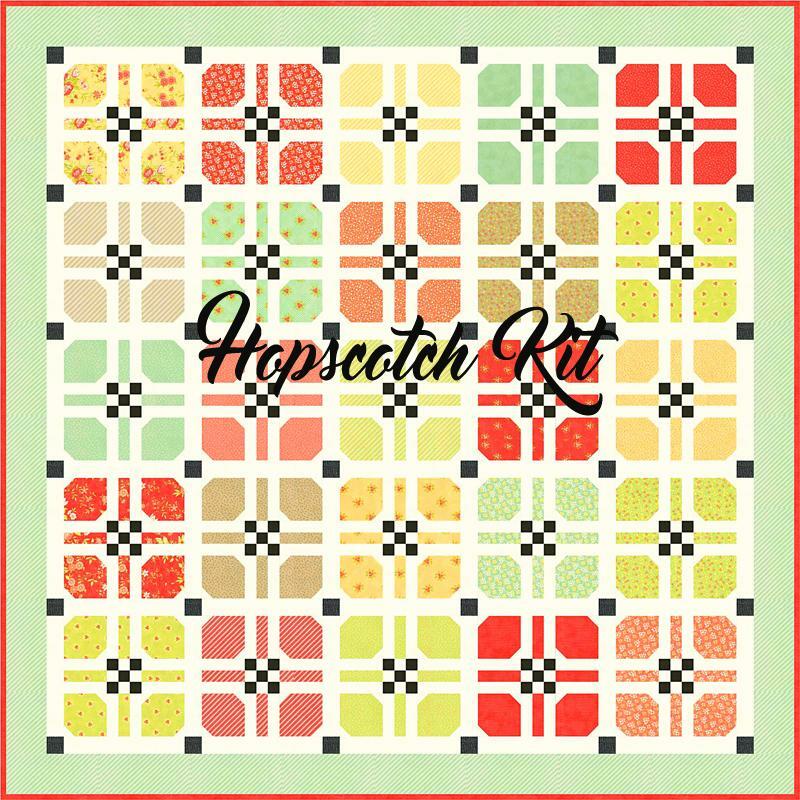 I'm a bit addicted to it and plan on making it in several other color combinations and sprinkling it about my sampler or even making it every other block.... I guess we'll have to see how it goes. The flying geese are quite fun to make when you know yoiu only have to make eight! And it looks good in so many different fabric combos! Here are all the blocks we've made so far.... just looking at them is making me a bit giddy right now. 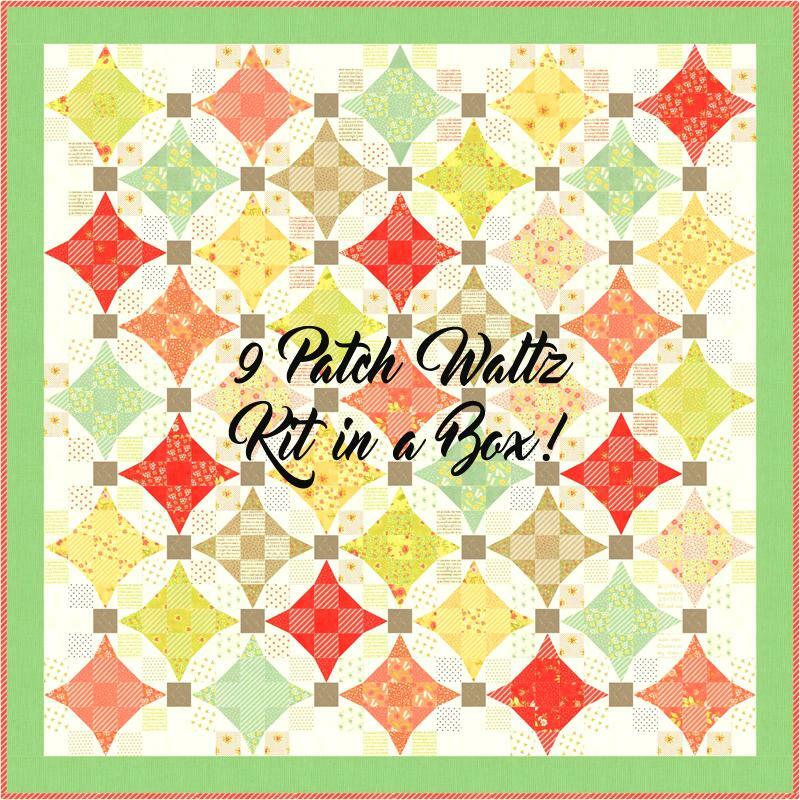 TIP #1: Many of these blocks use the method of sewing a square onto a rectangle, on the diagonal and then trimiming out the excess fabrics underneath. Whenever I use that method [which I love and use often], I trim out only the extra side of the piece on top and not whatever fabric was used for the bottom rectangle. This is because if you leave the bottom piece intact, it acts a foundation of sorts for your block. You cut that piece and it should be exactly the size you want it to be whereas the piece on top has been sewn and is often slightly irregular, coming out a bit shy of the shape or a bit large. The piece on the bottom will always be accurate and will help you with easier piecing as you build your block. The bulk of the extra piece has never been a problem for me or my quilter. The only time you can't use this method is when the piece that is being added on top is white/light and the piece underneath is dark. You must them trim out both pieces.i Try it and see some great results. Tip #2: On Anne's block we didn't want to fuss with the thin bias tape so we used a 3/8" bias tape maker, made a small piece of bias from the end of the fabric strip, ran it through the maker and affixed it to our triangle with little dots of Roxanne's Glue Baste It. It was quick and easy. 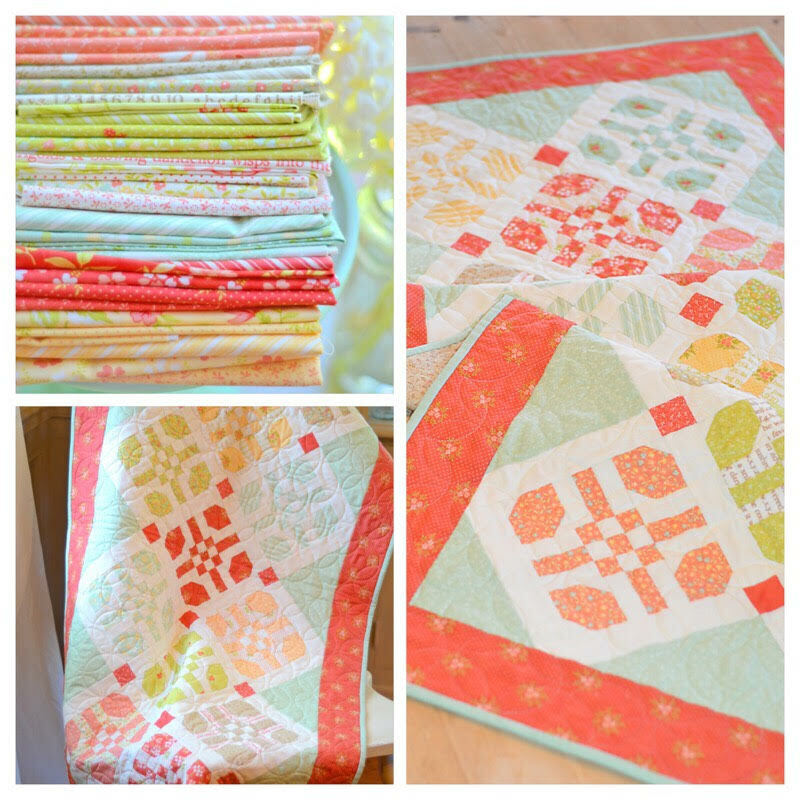 We plan on making many more blocks as more of our friends share them so check back over here throughout the QUILT ALONG to see how they are turning out! We might even make more tomorrow! ... our SAIL AWAY pattern. All of those boats are made from one Layer Cake. Can you believe it? We love, love this quilt. As we mentioned above, we are of course having an AVALON GIVEWAY. So leave us a comment about which color or specific print of Avalon you are looking forward to most. To see the entire collection, click on the AVALON button on the right sidebar so you can see all of the fabrics [we've fixed all the collection links so you can click on any of them if you like]. ... a styled shot of our SAIL AWAY pattern. Can't you just channel the beach when you look at those boats? Two lucky winners will be chosen, one for a DESIGNER ROLL and one for a LAYER CAKE. We will also add a third winner for a grouping of all our AVALON patterns and a charm pack!. Be sure to comment to be entered. Thanks for quilting along with us. Can't wait to see some of your blocks!